NASSAU, The Bahamas – Member of Parliament for Nassau Village Constituency, the Hon. Dewitt Halson Moultrie, was elected Wednesday (May 24, 2017) as the 54th Speaker of the Honourable House of Assembly. Deputy Prime Minister and Minister of Finance, the Hon. K. Peter Turnquest, moved the Motion, which was seconded by the Hon. Theodore Brent Symonette, Minister of Financial Services, Trade and Industry and Immigration. 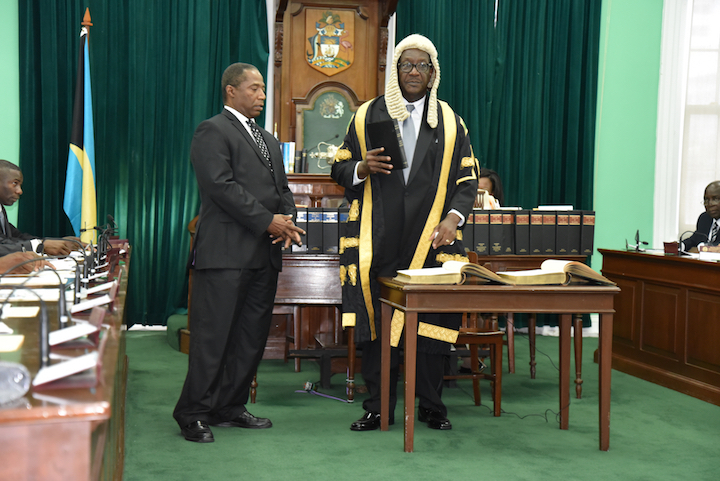 “It is with the deepest sense of humility that I take this opportunity to thank you Honorable Members for joining me to the ranks of my predecessors, the Presiding Officers, who by their conduct brought dignity and honour to this institution,” Speaker Moultrie said during his opening. “Approximately 288 years ago on 29 September, 1729, this institution held its first and John Colebrooke was elected as the first Speaker of the House of Assembly. This commenced an unbroken line of distinguished persons to occupy this Office -- each one having left their mark on the institution. Each footprint is essential to the unbroken succession of which all Bahamians can be justly proud. Speaker Moultrie promised to run a “tight ship” during his tenure as Speaker of the Honourable House of Assembly. “As your 54th Speaker, I wish to assure you that I take my task very seriously. I shall conduct the Office of Speaker and the business of this House in a fair and unbiased manner. I will nurture the ideals of the separation of powers and discourage functioning as a branch of the executive. “I assure you that I will claim for Parliament, all of those ancient privileges that have been won over the centuries of Westminster developmental history and I will defend them. We cannot afford slippage in these areas if we intend to advance this institution,” Mr. Speaker added. “I am only too aware of the true nature of my task in ensuring each of the people’s 39 representatives have equal standing in their House of Representative,” Speaker Moultrie said. “I wish to ensure all honourable members that when you cross the Bar of this Honourable House, the Chair will recognize you as the Honourable Member for whichever constituency you happen to represent – no more, no less. “While the chair is cognizant of the fact that the Executive is represented in this Chamber to account to Parliament for its stewardship of the people’s business, there will be an over-arching principle that as far as possible, all members wear the same sized cloak of honour and based on that conclusive presumption, all members are to be treated equally. Mr. Speaker paid tribute to his family and constituents of Nassau Village and also paid “homage to the late, great Dr. Myles Munroe,” who ordained the Speaker to ministry in 1989. “This great man of God and of the Gospel had a tremendous influence on my life. It was his tutelage and great measure that brought greater focus to my life. And still today through his many books, some published posthumously, I am learning the principles of dying empty. It is a principle of selfless devotion to service and to servant leadership,” Mr. Speaker added.